Super pleasant experience from Tea Forté! Was able to get a great hostess gift. 1st visit, will be back. Great service. I'm looking forward to trying the tea I got! It was a great experience! The staff were extremely nice and helpful, and the tea is delicious. A lovely shopping experience. Very fancy. Knowledgeable, friendly and helpful staff. So many interesting teas. Combinations I have never heard of before. You can sample and smell the different teas and learn about them. Appreciated the opportunity to go some place that I may not have gone to otherwise. Staff was very helpful with listening to my needs and personalizing their recommendations for me. Beautiful store with superior product. Loved it. Will be a regular! I enjoyed the experience, bought some tea, and got my free gift. Thank you. Very nice place, and very nice people. Thanks! Beautiful store and great service. Excited to try the tea! Tea Forte store was great - lots of products, free samples of several teas, and friendly service from the shop associates! The only drawback was that there were no prices displayed in the store. The folks there were super nice. Love the vibe of the place - I'd totally hang out there with my friends! STAFF WAS VERY WELCOMING AND INFORMATIVE. Great customer service, great atmosphere, delicious teas. Easy to use the nift. Great selection, helpful staff. I even got an extra free sample with my purchase. The saleswoman was lovely and helpful and the atmosphere was great! Would reccomend, and I’m not a tea drinker! The salesperson in the store was extremely helpful and friendly, and she helped me find exactly what I was looking for! Very helpful service. Large selection of teas and beautiful wares! Very attentive and friendly staff. The staff person who helped me even offered and made an additional sample for me for a tea I was curious about. Never been there before, shop was cute and I liked that you could smell all the teas in one place. Hi! Can we clarify in the future that the $12 can only be applied to the tea infuser? I felt a little embarrassed that I had to ask the sales associate, but honestly, on a graduate student budget, it'd be nice to have these specifics more clearly written out! Very helpful service and great tea offerings. The manager was extremely helpful. Awesome store with really great features. Happy to have received a Nift credit there as I would not have known about it otherwise. Will be back! Loved it, will definitely go back! The girls who helped us were very friendly, knowledgeable, and helpful! Great gift....great and knowledgeable staff! Thoroughly enjoyed my visit to Tea Forté. The store is beautiful, and the staff was incredibly helpful. I had been meaning to stop in for a while, and I’m so happy I finally did. My wife and I went to Tea Forte for the first time because we had a certificate from Nift. In short, Tea Forte is awesome! The customer service was great! Very attentive, very welcoming. The teas have remarkable taste and quality. We bought lots of different types of tea and will definitely be going back. Tea Forté is a beautiful store. The staff members were pleasant and helpful. Look forward to returning. I had the best time visiting Tea Forte!! I will definitely go back! The customer service was incredible, and the teas were such high quality. I’m hooked! Great tea infuser! I'm so glad I got this Nift gift, because it encouraged me to visit a store I wouldn't have otherwise. Now I'm definitely going to go back and purchase something! smelled a bunch of different teas and they even gave me a sample! really happy with the new teas that I got. Incredible experience! The tea tasting is wonderful! Very pleasant and relaxing for a date or a weekend activity! The salespeople we so helpful! Really awesome atmosphere and staff! I am definitely coming back. The store is amazing and staff very helpful! Kimberly at Forte Tea was wonderful! Will definitely go back. The staff was informative and helpful. Tea Forté was great to pop into on a fall day. They have so many different teas and have created such a nice, relaxed atmosphere that lets you see and try their teas prior to purchase. Highly recommend! The sales rep was great. I loved this little shop. The very knowledgeable and friendly baristas Facebook me a tea tasting and even showed me how to steep green tea (who knew there was a special temperature? It actually makes a difference). I will go back there to get my holiday gifts for sure. the sales clerk was wonderful and the prices were surprisingly good considering it's on newbury st.
Great loose leaf tea and staff was super friendly. They helped us out for a good 20 minutes, letting us smell all the teas they had. Really cool tea shop with very friendly hosts, unique and calming interiors. They really make you feel welcome and will let you try any of the teas, which are delicious. The free infuser is adorable and really useful if you enjoy loose leaf tea. The store is beautiful and they have a great selection! The associate in the store at the time of my visit was so sweet and helpful in showing me around. (She also didn't force me into buying anything, which I appreciated.) I ended up buying a small trio of assorted teas after browsing the store. Overall, this was a great experience! Would definitely recommend checking Tea Forté out. Very elegant place, great service, wonderful tea! A lovely store experience. I’ll be back when I need some tea, for sure. I will definitely be returning to Tea Forte after my first experience last week. The staff were helpful and informative, and the samples were delicious. Tea Forte on Newbury Street, the service was wonderful! If it was not for Nift, I would not have discovered this great place! I would definitely go there again! Tea Forte has a nice collection of teas and the associate there offered two samples I enjoyed tasting. She also gave some information about the store and was helpful. The new Tea Forté retail store on Newbury Street is a lovely calm and quiet retreat from the hectic activity of Boston streets. The minimalist design aesthetic is striking. There were two retail associates working when my family visited and they were both pleasant, professional and helpful in explaining the different tea options. Did I mention samples? Delicious! 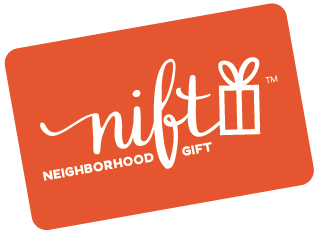 They were happy to accept the Nift gift and that transaction was quick and easy. I was so excited when I received this Nift gift. I hadn't heard of this local tea shop before, and now that I know it exists I'll definitely be back! Their tea is lovely and the samples are a great opportunity to try something new. The infuser was a great gift idea and I bought a nice Tumeric tea. It was so cool to check out the shop and I love the gift. I will definitely be going back! Hi there: Usually I'm a little intimidated by Newbury Street shops but the person working that early evening was very warm and inviting. All kinds of teas to choose from. Some samples were available to try in the shop. I love ginger tea and they had two types to choose from! Will definitely be back. Loved the Nift and the chance to be introduced to this nice store! The employees were very helpful and I ended up finding a great tea. So positive that I’ll be back! Very friendly staff! Store is beautiful! The salesperson was very helpful and patient as I tried several teas before purchasing a canister. I had not heard of this new store, and the gift from Nift gave me the opportunity to go by and learn about its wonderful collection of teas. The staff was knowledgeable and courteous. I will definitely become a customer! Great tea shop! They were super nice and you can get whatever you want. Great selection of teas and seems high quality. I've had this tea before, so I know it's good and was happy to discover that they have a store in the area. The staff were very friendly and helpful. Note that Google Maps shows the store at the wrong address up the street! Highly recommended 5 stars! Very professional staffs and upscale Tea stores that you have never seen it before! Very fancy! I would highly recommend this place. The store is very clean and has a lovely aesthetic. You can smell all of the teas easily while seated. You can try some tea freshly brewed. They have variety packs as well as loose leaf tins. Great service! Great product! Had an enjoyable time. Delicious tea, great customer service! Specifically brewed something we wanted to try. Really good customer service! They gave me lots of teas to smell and taste, and we had a nice conversation about Lapsang Souchong tea, even though they didn’t carry it. Tea Forte was great - super friendly and knowledgeable staff with very good tea! Very impressive store with huge number of tea options and accessories. Erin was so helpful in explaining everything they had, as well as providing samples! It is a very friendly, professional and clean store with amazing selections of tea as well as cups and other tea paraphernalia. Staff was very polite and patient! Very friendly staff. Good product. Would recommend #5, but the buttons are broken and won't click. The associates were knowledgeable on the different varieties of tea. And I also picking up a tea infuser holder. The customer service specialist was friendly and very helpful at the Tea Forte. I was able to shop and taste samples of the tea. This was a great experience. Very warm. I will go back! Staff was wonderful and I will definitely be back! Beautiful (pop-up) store and products. Loved the lay out of the store, the tea sampling, and the minimalistic design of everything. I loved the store, and upon leaving, I was confused by the email from Nift. Could I have spent an additional $18 there? If so, I would have preferred that to getting a different Nift for the remaining value. Great customer service! They told me the history of the place, gave me a tour, and helped me out in picking the perfect tea for me! Allison was really helpful and friendly. I'll definitely be back to pick up some more tea. Beautiful store with delicious teas and friendly staff, prices seem comparable to other tea stores in the area. Tea Forte has a lovely and relaxing shop on Newbury St. Their teas are beautifully displayed and they had 3 to sample. The store associate was very helpful and walked us through the loose leaf tea options and provided helpful recommendations. She offered to brew a tea separate from the ones that were available for sampling and gave us free samples to brew at home. I would highly recommend this store for tea lovers or those who want someone who is knowledgeable about different types of tea. They were great, very friendly and great teas! The service was wonderful! Thank you! I live near here but never went in. I really liked the store and already want to go back and show my friend. Salesperson gave me a lot of attention and let me sample and smell a couple of different teas. She also explained how to brew the teas. Really glad I stopped in. Staff was very nice and helpful! Great service from the staff - very friendly and polite! I loved how clean the aesthetic was, and the tea tastes great! Well worth a visit if you love tea. The staff was very friendly and they even gave me extra tea! They were amazing! Very attentive and full of information. I look forward to going back! Nice selection of teas and the sales lady was very helpful. Makes for great gifts for tea lovers! I tried it out as soon you as I got home and it worked perfectly . Thank you for the great gift. Excellent tea. great store design. Super friendly worker, gave me a run-down of the place since I've never been there. Gave me samples to try on the spot and samples to take home to try with my new tea-infuser. 10/10! The service at the store was great! Packaging was also beautiful but products could come in more size varieties. Great customer service, and fun selection of tea to choose from. Amazing staff. Amazing experience. I will definitely be back. Have walked on Newbury so many times, but never realized this was here! Great tea shop! So cute! I loved Tea Forte! I am actually not a big tea drinker myself but I redeemed my Nift as a gift to a colleague. I was so impressed with everything about this place - the atmosphere, the products, the customer service - everything was great. I can't wait to share the gift with my colleague (and others) so they can visit the store themselves. Maybe I'll even become a tea drinker! Fabulous customer service! After I identified myself as a newbie to exotic, loose-leaf tea, the shop assistants were kind enough to offer a tea tasting and described their method of brewing. Can't wait to use my new diffuser! Enthusiastically staffed storefront featuring tea products that are almost too elegant to drink. The store features distinctive blends containing unique ingredients such as butterfly pea flowers. The signature pyramid theme is carried throughout in both the single-use and reusable infusers. I cannot think of a place to find a better gift for a serious tea drinker. My visit today was very pleasant even in this rainy weather! Erin was very helpful and friendly! This was a fantastic gift, thank you! Tea Forté was great. The woman who helped me knew about all of the teas and let me try anything I wanted and made great suggestions. Very nice experience. Everything is so elegant and the tea is amazing. Ladies who work there are super nice. We will come back! It's a beautiful shop with amazing service! The staff was so kind and friendly, and visiting the store to taste and smell the teas was super helpful! Highly recommend. Staff were super friendly and helpful and the layout of the store was very appealing. Excited to try my new tea! The store was so beautiful and the woman working was helpful and kind. Glad I know it's there now! This was a great nift! Can't wait to try some loose leaf tea. The tea is pricey at Tea Forte, but they definitely have some great flavors. Staff was super friendly and knowledgable too! Everyone was so helpful and the tea is very good. There's a wall with loose leaf tea you can look at and smell before you buy. The staff was very helpful in describing the various types of tea, and pointed me in the right direction for selecting some as a gift. Very helpful employees and great customer service! Bright, feel good place- friendly and helpful staff!! Great place! I wouldn't have known about it without Nift, thanks! Jason was very helpful and patient explaining the different teas. Seems like really high end, high quality teas. The people were super helpful and gave me a sampler of tea bags to try! Fantastic place for tea and accessories. The staff are wonderful and so helpful! Staff was very friendly and helpful and I thought the Nift they gave was a cool way to get started with their brand/product. Was such a great experience. Loved the store and the employees were so enthusiastic and willing to help me pick out the perfect teas! The employees were super friendly and helpful. The store was beautiful. I am looking forward to going back. Good tea, great service, locally owned. Great stuff! Erin was very helpful and took the time to help me find the tea I was looking for and share with me some brewing tips! Great service - staff went above and beyond in helping me with my purchase! Beautiful store with helpful salespeople. I am familiar with Tea Forte but it is my first time in a Tea Forte store. Nice to be able to see and sample the tea selections. Wonderful, friendly service! You can smell all of the different teas before deciding which to buy.